I hope you find use for it. Feel free to share it, too. Comments? Suggestions? Please leave them below. Is Your Interest Peaked or Piqued? 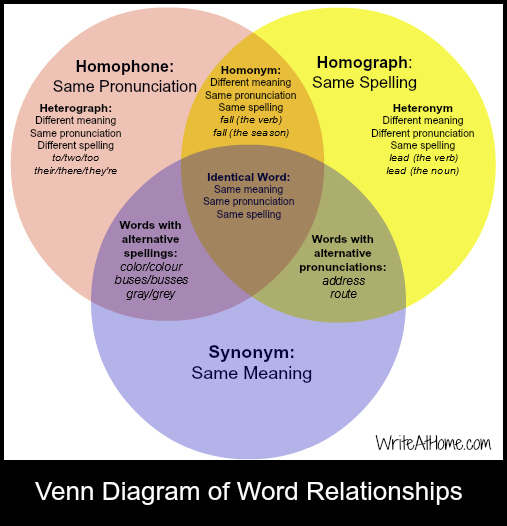 Only someone who loves words would invent a diagram like this. Thank you for organizing a set of confusing terms! Guilty. Glad you like it. And route and rout can go into the heterograph category. Oh my, confusing and yet kind of fun…yeah, I’m weird! Very observant. You are correct about “address.” It is also a homonym. Words can be in multiple categories.